Rich, creamy, savory and delicious ultimate potato salad. 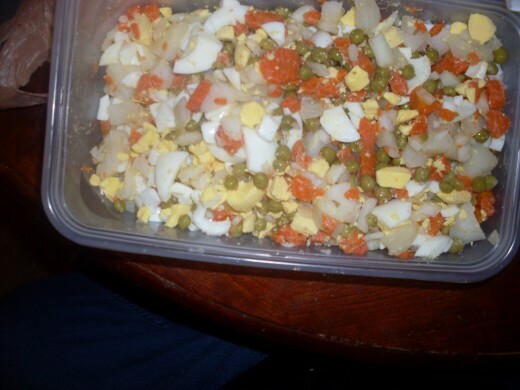 Potato salad that is made well is so delicious. I really enjoy eating a good potato salad. For the ultimate potato salad, you've got to consider all the little things like what type of mayonnaise would be the best to use. You will want to use a really good one to add creaminess and fresh flavor to your potato salad. Would you like to know a recipe for how to make the ultimate potato salad? This ultimate potato salad recipe needs some key ingredients. For any recipe requiring mayonnaise as this ultimate potato salad recipe does, I always recommend Hellmann’s mayonnaise. I think that it is the best tasting mayonnaise that I have had. 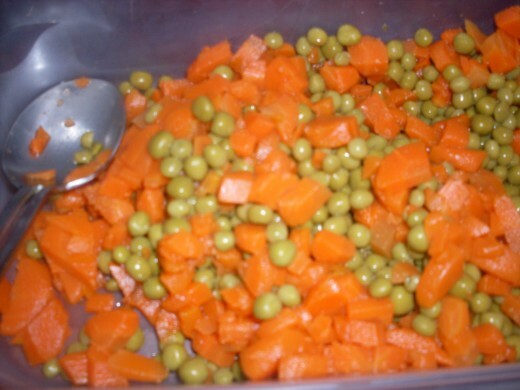 and carrots and green peas. 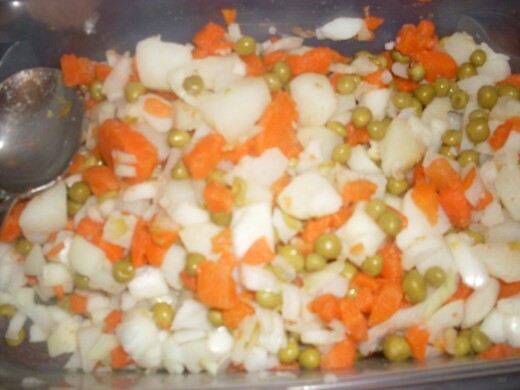 For this ultimate potato salad recipe, it is okay if the carrots and green peas are from canned goods that you have on hand. 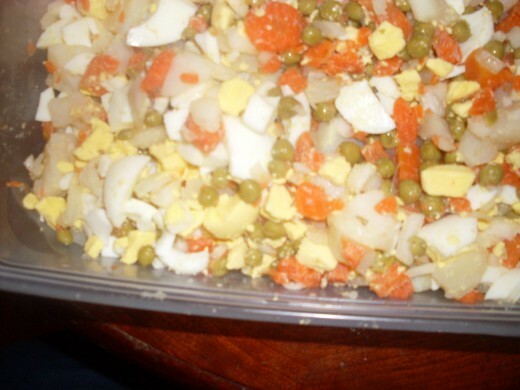 For this ultimate potato salad recipe, cut up the peeled, boiled potatoes and the peeled, boiled eggs and put them in a large container along with the carrots and green peas. Now, before adding the mayonnaise, sprinkle some of your preferred spices sparingly on top of the ingredients. 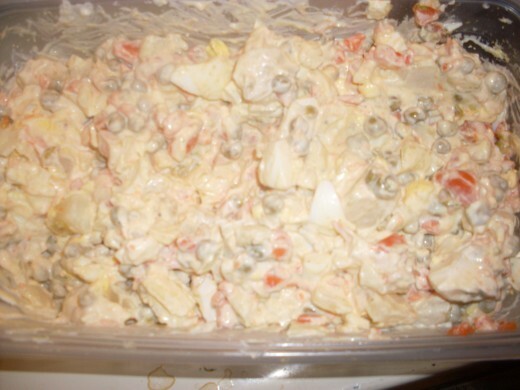 Then, add the mayonnaise generously for a creamy and a memorably delicious potato salad. This ultimate potato salad can be great for a pot luck dinner, picnic, barbecue, or sit down dinner meal including special occasion meals such as Thanksgiving dinner. This ultimate potato salad will not disappoint. Hellmann's mayonnaise is my favorite brand of mayonnaise to use while preparing this ultimate potato salad. Hellmann's mayonnaise has a great taste. Add the mayonnaise generously for a creamy and delicious potato salad. For this ultimate potato salad recipe, you can easily purchase the raw potatoes that will be needed. You can typically find them at your local supermarket. 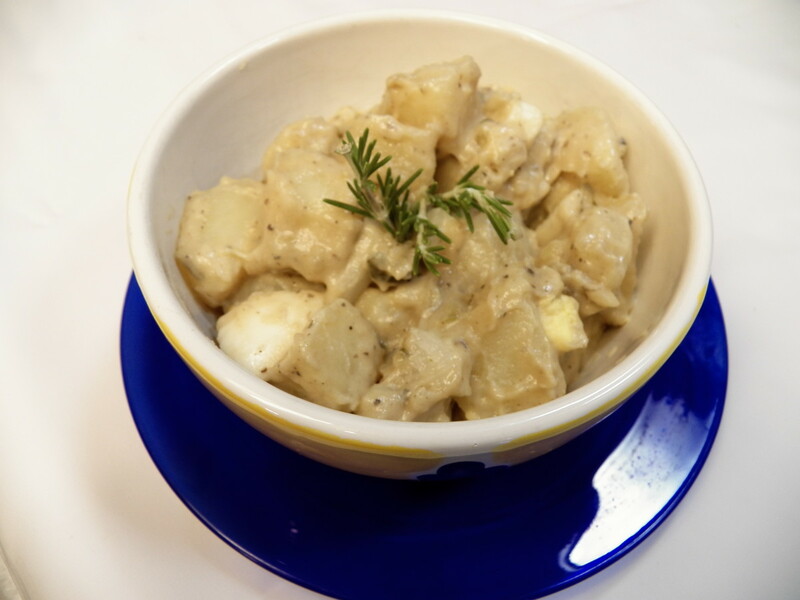 Many varieties of potatoes can potentially be used for this potato salad recipe. Most often, I use russet potatoes to prepare this potato salad. 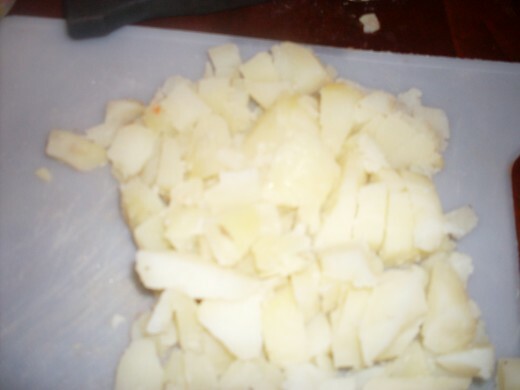 Potatoes take quite some time to boil adequately. For this ultimate potato recipe, take as many potatoes as you think you will need to feed the particular number of people that you have in mind. Think of two potatoes per person. So, you might be boiling eight or more potatoes. Wash the potatoes well. Because of how potatoes grow in the earth, there might be quite a lot of dirt and even some insects on them when you bring a large bag of raw potatoes home from the grocery store. Before you bring it to your home, inspect the bag of potatoes to avoid picking up a bag of potatoes with insects in it. You might want to pre-wash the contents of your bag of raw potatoes even before the day that you will be needing to use them and wash them again on the day that you are ready to boil them. If you cook potatoes often, I’d like to suggest that you use a brand new toothbrush especially designated for the potatoes to scrub the potatoes while you are washing them. That is how dirty they might be and that extra scrubbing with the toothbrush can potentially help a lot. For boiling the potatoes, choose a large pot and add to it more than enough water to cover the potatoes. Depending on how many potatoes you are boiling, you might even have to use two pots side by side on the stove top. Wash the potatoes well before boiling them. Typically, when I prepare a potato salad, I have to boil about eight potatoes but sometimes it might be ten or twelve potatoes or even more. Are you feeding family or friends on a budget? Potatoes are one of the best things that you can use to do that. Large bags of potatoes are very inexpensive in the grocery store. For example, a four pound bag of potatoes might cost $2.79 or even less. You might need to pick up two or more bags of the potatoes as you see fit, not just one bag of potatoes at the grocery store. Potato salad is a great addition to the spread at any family gathering. Potato salad is commonly paired with meals such as fried chicken or barbeque chicken but potato salad can even go well with the turkey and other dishes at Thanksgiving time. 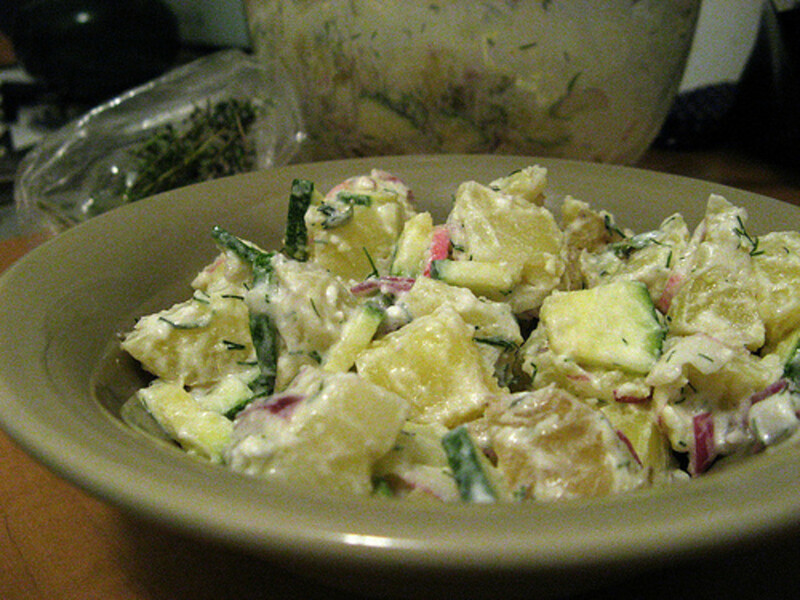 Potato salad is popular and great for serving at either an indoor party or an outdoor picnic or barbeque. 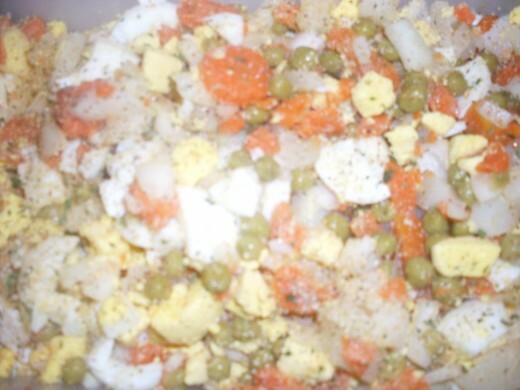 Although this potato salad this not have dill in it, sometimes dill pickle flavor is used in potato salads. The last time that I had dill flavoring in a potato salad, it was very good. I have also on occasion had potato salad that had mustard in it. Mustard is very well suited for potato salad. Just like deviled eggs are made with mustard, the mustard also goes well in the potato salad that contains egg. “Please pass the potato salad” is a very common phrase. 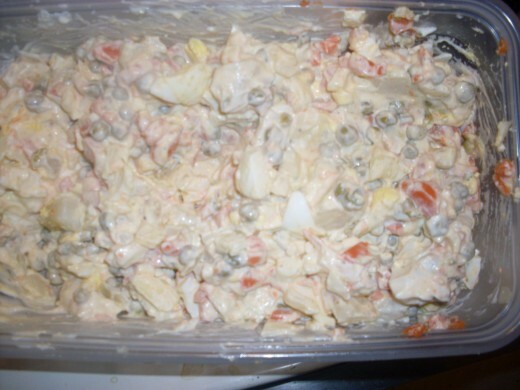 A well made potato salad is enjoyable and delicious and people will often want seconds after the first helping so go ahead and pass the potato salad to your fellow dinner guests! 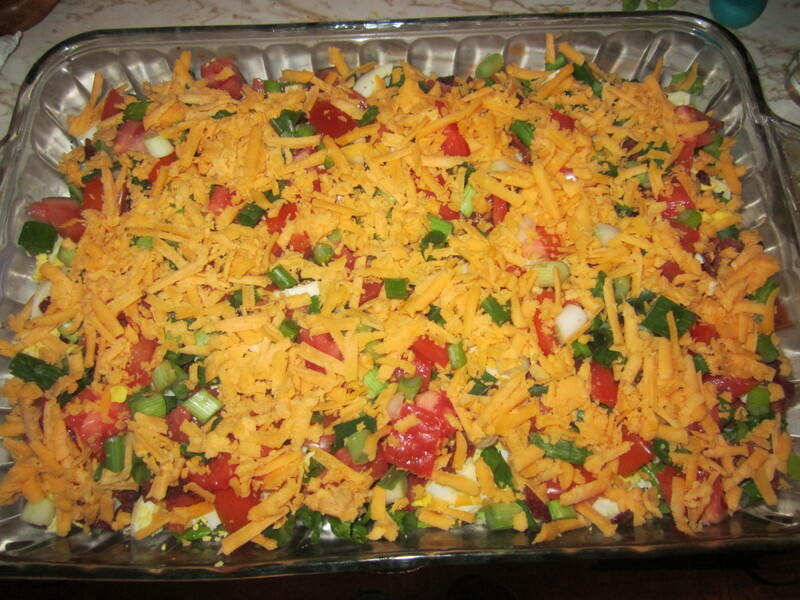 Cover leftover potato salad with foil and store in the refrigerator. Generally, this potato salad also tastes best chilled and when initially making the potato salad, make sure that the boiled potatoes are very well cooled before adding the mayonnaise. Please pass the potato salad. 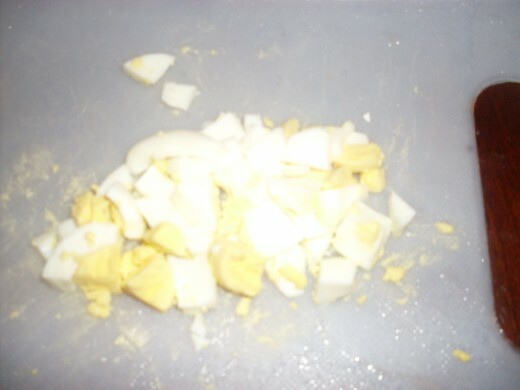 Fresh hard boiled eggs contribute to the great taste in the potato salad's savory blend. The ultimate potato salad is really coming together now. Especially when well chilled, the delicious ultimate potato salad is ready for you to dig in! Rich and creamy ultimate potato salad, made with Hellmann's mayonnaise. If you could choose just one item, what would you most prefer as a side item for meat at a picnic or barbecue? What would you most prefer? Have you ever taken a potato salad that you made to a barbecue, picnic or pot luck dinner to share with others? Hi peachy, Thanks for your comment on this hub about potato salad. I appreciate it.